New and not so new projects were the priorities for finishing club this month. Julie's Fun Bag & Quick Zipper purse from Postcard - Bunny, Heather's felt Christmas tree from Home for Christmas and Ros's Garden Angel. Sue's blocks for Cherry Cream Squares and Jenny's for Summer Berries. Love seeing some of the older projects being finished! Being Christmas Eve you'd expect this post to be all about Christmas, but it's not. To be honest I'm still in wedding mode, maybe tomorrow it will feel like Christmas! As soon as the wedding was announced I knew I'd be making the bride something with this fabric. It's difficult to see bundled like this, but it is left over pieces of fabric from my mum's wedding dress, and has been stored like this for almost 60 years. So it is very very special! Over the years I have thought about what I'd make with it; when I loved making dolls, it was going to be a doll but lately I'm hooked on making purses with the metal frames. The pearls belonged to my Nana and the the ribbon was a wedding anniversary gift from my husband many years ago. The bridesmaid purses were made from fabric which belonged to a great Aunt. I guess you can tell I hate throwing anything out! The fabrics were too special to cut into without first checking the fit and shape. I used the first fabric to hand, which just happened to be red. It needed something extra, so this week, I've been cutting out leaves and flowers, arranging and rearranging them until I think I'll go with this. It's not appliqued down and yes, it's going to be tricky to sew them without catching the lining. You and I both know it would be easier and quicker to start from scratch. I feel like I have failed the Christmas Challenge - no decoration this week, but if I manage to finish this tonight in between, making salads, another batch of salted caramel fudge and wrapping gifts I will call my challenge a success. You may remember I started my yo-yo quilt last year. Not a great deal of progress to report! Lucky the deadline is December 2019. Making the yo-yos is fun, stitching them together not so much. Rather than make all the yo-yos, then sew them together, they're being sewn into blocks as I go. So far I have four blocks - only twenty-one to go! The wedding was perfect, and the bride and groom could not have looked happier. Have a wonderful and safe Christmas. We were in for a treat at cushion club last Saturday. Beth came with her Garden Party quilt top. It was exciting to see it made in blue. Love it and want to make another one now! The pattern for Garden Party is $10 plus P&H and is available here. Deb arrived with her Sarah's Sampler (1855). All done except for the binding. It looks stunning. The blocks and borders have been custom quilted. The seven patterns for Sarah's Sampler (1855) are available here. Obviously, class didn't start straight away as we were all too busy looking at both the quilts. This month the girls were working on Sitting Pretty. Karen & Bronwyn decided to make the Hexagon cushion. Both girls still had a couple of hours sewing to go, while all Beth needed to do, was finish making the yo-yos and stitch them on. Everyone needs a standby project; something to pick up and work on when there is simply nothing else prepared for hand-sewing. Yo-yos are my thing. They were started with nothing in mind other than having something to do. The first fabrics I grabbed were my reds and that's the colour I've stuck with. I still love the idea of having a collection of red & white quilts and think a Yo-yo quilt will fit in beautifully. As you know I make a new red & white quilt each year. Something tells me this quilt won't be finished in time for this Christmas or the next or even the one after that. My deadline is Christmas 2019 – yes that’s right 2019. This is a long term project and besides, I only get to work on it when there is nothing else to do and that rarely happens. Here are just a few of the things girls have made or brought along to class. I do love seeing the projects finished or close too. I know myself how difficult it can be finding time to complete things at home. The Red Treasures girls brought in their pieces from previous classes. One of The Bunny Sisters. Heather's made two now, the first was a gift. The Strawberry Yo-Yo table runner made by Julie. Aren't we lucky to have so many gorgeous red fabrics to choose from. Do you recognise one of them from the last post? Miranda's Strawberry Yo-Yo table runner in the process of being hand quilted. Tamara's quilt. I love her choice of colours. It might be called the Red Treasures club but this doesn't mean you have to use red. The girls are encouraged to work with their favourite colours and fabrics. The lastest Red Treasures project - Treasures from the Past, a pincushion and scissor case. No red here, apart from Gabby's birds. They have the option of making the stitched pincushion or the quicker - no stitching at all version. You can see which one some of the girls opted for last night. Annette's pincushion is what I'd call gorgeous and funky and Tamara's is a perfect match for her table runner. The Get Set for Christmas Club at The Material Girl, Yarrawonga was a great success. A few of the Sweet Treats bags the girls made in the morning. Somehow I missed taking pictures of their ﻿How Many Sleeps? Oops! This winter seems very cold. Yes, it is winter so what do I expect, but it feels like the coldest one we've had in years. Days around 10 deg C. with no sunshine and very little rain. Somedays it's been so miserable I've chickened out of walking. And much too cold to take Azz the dog for his walk. He'd be happy to be out of the house, but I'd freeze between steps he is so slow now. If I'm not tucked up at home then the next best thing is teaching. Don't these fabrics look warm and cheery? These are the fabrics the girls in the Red Treasures Club at Avonleigh are using for the current project Strawberry Yo-Yos. I love seeing the variety. Miranda' finished bunny from the last class. Then it was to The Material Girl, Yarrawonga for the Christmas club. This is one of my favourite projects to teach, Simple Pleasures. Everyone loves Barb's decorations and all go home with one finished or close too. There was a choice in class night - machine piecing, making the yo-yos or doing a little of both. I was surprised they all opted to piece the top. Me, I would have jumped at the chance to sit and hand sew at the end of a long day. Sue completed piecing her top and then pulled out all 28 finished yo-yos. No need to make yo-yos if they're already done! I'm sure the runner will be completely finished next time I see her. Remember those lovely fabrics sent to me last week from Lynn at Li'l Blokes. Here is what I made. It seems to have taken no time at all. I've worked on a bit here and there while watching the tennis; well a whole lot more listening than watching. I find the tennis the perfect backdrop for sewing to. Just by listening to the crowd cheer you can tell who's won or lost a point. And if the points been won by a spectacular shot, you can always catch it on the replay. Can anyone tell me where the year went? I'm sure they speed by faster and faster each year. I've been reflecting on the things I have managed to achieve this year and I guess the big one for me was to start my design business. I had been thinking about making it 'official' for quite some time and finally took the plunge. The other major item was starting this blog and what a fun journey it's been. I think the blog has been one of the reasons why I have been sooo good at finishing off a number of projects. Thank you to all of you who have taken the time to leave a comment. Your words of encouragement are truly appreciated. 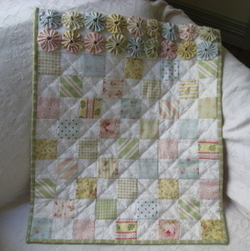 Here is the doll's quilt I started the other day. It turned out exactly as I imagined it would - oh so pretty. And it didn't take me very long at all (was finished Saturday). I love small, quick and achievable projects. Things that can be made in a couple of days and then used to decorate our home. Unfortunately, I'm still afflicted with the yo-yo making bug. Will I ever be over it! I'm back working on the Spot the Yo-Yo quilt. I've nearly caught up to Bronwyn. I know it's not a race but it does spur you along, when you are both working on the same project at the same time. So how do I plan to spend New Year's Eve? If I get the chance I'm going to finish the blocks. The thought of having the quilt top finished this time tomorrow is too exciting for words. My 2008 wish to you all is to finish everything you start and finish those things previously started, even if it is something as simple as a single Yo-Yo.